Nathan had just eaten and I had gently tucked him back into bed. I could hear his feet thumping down while he chortled softly with contentment. I walked into the kitchen to get a glass of water. My eyes were blurry. My joints were aching because, well, I’m getting old and that’s what happens when you get old… your joints ache. It was too early in the morning. The cats were racing around the house. Playing Tag or Cops and Robbers or whatever it is cats-that-think-they’re-human play when they’re feeling rambunctious at 2:50 in the morning. I looked down as Andrew scampered past me, tail poofed to maximum capacity, his fat rolls jiggling from side to side. A tuft of his fur floated down onto my foot. With a sigh, I bent over and picked up the lone wad of fur and tossed it into the trashcan. As I stumbled around the semi-lit kitchen, my bare feet stepped in something. Something that stuck to the bottoms of my feet. Bleary-eyed, I looked down but was so tired I couldn’t tell what the mess all over the floor was. It was speckles of something. It looked like pencil shavings, and it was ALL OVER THE KITCHEN FLOOR. I squatted down on the floor, trying to figure out what this mysterious substance was when I noticed some sort of colorful bag hidden halfway under the refrigerator. I picked it up by the corner. 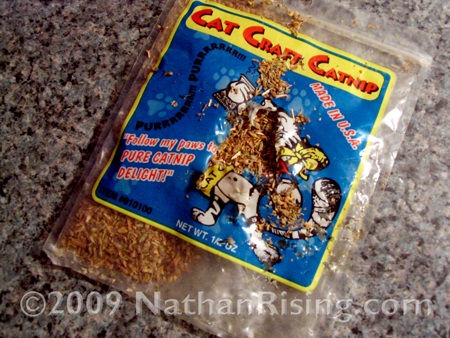 The cats had somehow found and drug out an old, unopened bag of catnip that was probably about five years old out from the dark recesses of the Appliance That Hides Everything. Only it was no longer unopened. They had sliced the bag open with sharp and somewhat talented little claws right smack dab in the middle of the bag and had scattered STALE CATNIP all over the place. Did I mention it was 2:50 IN THE MORNING? Cats and their ultra sensitive noses. I still can’t figure out how they managed to drag that out from under the refrigerator. Go-Go-Gadget-Cat-Arm? I mean, the catnip sat there for years. And all of a sudden, it was discovered, ripped open, and devoured. And I had four very catnip-drugged and hyperactive cats to prove it. When I swept the catnip up, ALL FOUR OF THEM raced into the kitchen and started LICKING THE FLOOR. Like I had just taken away their LIFE SOURCE. They were acting like the feline equivalent of a human crack addict. They followed me around, meowing plaintively, their noses sniffing the floor while they looked for any little crumb of their feline-drug to consume. C’mom, cats! IT’S FREAKING STALE! And I promise, YOU WILL LIVE WITHOUT IT. I think an intervention is in order.